Alternate history, time travel romance, and military fiction. “In this stellar time-travel novel, a modern-American nuclear-powered cruiser sails through a time portal and goes back 152 years to the days just before the beginning of the Civil War. The USS California, under the command of Capt. Ashley Patterson, an African-American woman, is headed toward Charleston, S.C., to participate in a ceremony commemorating the first battle of the Civil War: the bombardment of Fort Sumter on April 12, 1861. But before her ship reaches its destination, the massive cruiser–and its 630 crew members–travel through some sort of temporal wormhole and end up near the Charleston Harbor in 1861, just hours before the Confederate assault is about to begin. After eventually wrapping her head around the fact that her entire crew has traveled back in time, Patterson realizes that she has some difficult decisions to make: Does she let history repeat itself and focus on trying to find a way back home, or does she use the military superiority of the California–“outfitted with enough firepower to unleash Biblical hell on an enemy”–to help end the war quickly and thus save the approximately 620,000 soldiers who would otherwise die in the next four years? Powered by a cast of well-developed characters–Lincoln and Lee are among the prominently featured historical figures–consistently brisk pacing and a pulse-pounding conclusion, the humanist themes of this novel are momentous and just as timely today as they were back in the 1860s. This book is bargain priced from 01/10/2018 until 01/14/2018. This book is bargain priced from 04/06/2015 until 04/10/2015 Check book price before you buy, as prices can change due to expiration of the sale or other technical issues. The United States is a country at war. Andy Richardson sees enlistment as an opportunity to get away from the farm life he so desperately hates. During his three year enlistment in the army Andy finds out who is really is and who God is. He learns what it is to have a true relationship with the Lord. Saying he is a Christian is no longer good enough. Along with Andy’s spiritual growth is the growth of a nation – a nation that is stronger as a whole not separated. To help her impoverished family, Sophie agrees to marry a wealthy older in far off America. Less than twenty-four hours after she arrives in German’s Mill, Pennsylvania, events have taken a far stranger turn than anything she could have imagined. Set in Post-Civil-War Pennsylvania, this tale of an arranged marriage is as much family saga as romance. Sophie is a sensitive young woman struggling to make sense of her past and to understand her new homeland. Karl is not only a veteran of the Great War, but scarred by the secret violence of his childhood. How they both learn to trust—and to true love—is a unique story. After her parents die in a fire, Sophia Whitfield struggles to save her beloved home, Arbor Rose. The Civil War has devastated the South, and another blue coat has come to steal her meager possessions. Before the hated enemy inflicts his destruction, she shoots him… and then discovers the soldier is Gavin, the champion of her childhood. Gavin’s dark secret lurks in Sophia’s future. When she discovers the truth, she’s torn between a burning hunger for the man she truly loves and loyalty to Jesse, her betrothed. The despicable acts of war have changed everything Sophia and Gavin once cherished. Yet somewhere deep in their hearts, the mystic Land of Falling Stars still exists. Heck Martin’s motto was simple. If they left him alone, he would leave them alone. Heck Martin was not pro-Union, like his father and brother. He had joined up with Quantrill to harass the bluebellies and other Union feds that thought they could tell others what they should be doing. But after the massacre at Lawrence, Kansas, he wanted nothing to do with Quantrill and his gang. Thirteen other hard-bitten veterans had followed him, had joined with him, but soon grew to hate him even more than they hated Quantrill. Then suddenly, the war is over, and Heck knows that most of his “men” would be out to kill him. But they all feared him. He was the fastest with a gun they had ever seen. Also, Heck had warned them, when he left for home, that if anyone followed him or tried to cause him or his family harm, he would kill them on sight. Cotton Petty and the other bushwhackers had not left him alone. They had tried to kill him, and failing that, had killed two members of his family. For that he would hound them to the ends of the earth, if need be. From now on, until he was dead or they were all dead, there would be war between them. Follow Heck Martin as he tracks the deadly bushwhackers across the 1865 wild west landscape of Missouri, Texas, New Mexico and Arizona. Heck’s tracking skills are put to the test in a deadly game of cat and mouse, sprinkled with Comanches, wild west women, mountain men and plenty of gunfights, horses and cold blooded killers. He also has to avoid the bluebellies who are hunting him, as well as a bounty put on his head by Quantrill, for leaving him during the war. If you miss Eastwood, Heck Martin may be the next best thing. If you prefer gun-shy writers and cowboys who fight range wars with their fists, you will have to look elsewhere. Van Holt’s hellbound gunslingers plan to send the bad guys there first, before the government takes away their guns and lets the bad guys keep theirs. 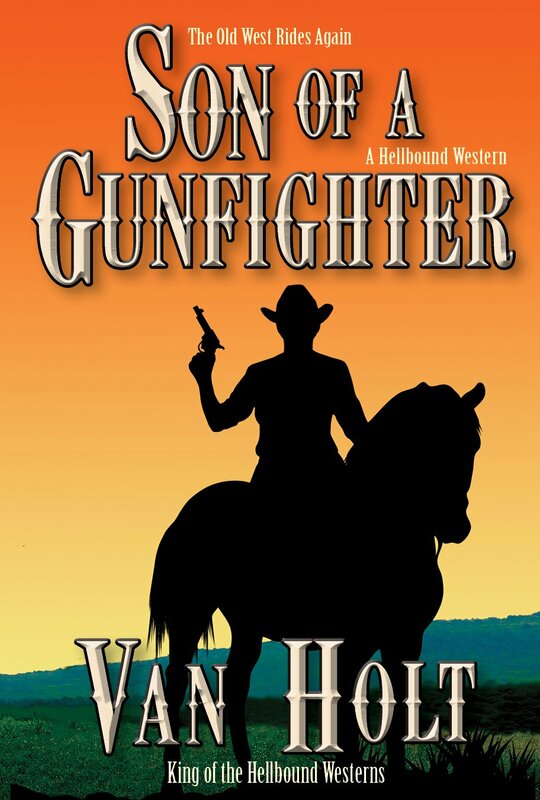 Warning: Reading a Van Holt western may make you want to get on a horse and hunt some bad guys down in the Old West. Of course, the easiest and most enjoyable way to do it is vicariously—by reading another Van Holt western. Van Holt writes westerns the way they were meant to be written. Dan Whitton’s father was the most hunted and desperate killer the west had ever known – not hunted by the law, but by the man who had destroyed his chance of living in peace with the girl he loved. Now Bob Whitton was dead, and the man who had finally succeeded in having him killed was still alive, fat and prosperous and gloating in his triumph, and already planning a similar fate for Bob Whitton’s son, Dan. So Dan Whitton strapped on his guns and headed for the wild Cimarron country where his father had spent so much time, hunted by his enemies. Those who were still alive would soon be hunting Dan Whitton. Jed Baker and Bill Hicken rode with Quantrill in the early days of the Civil War. After the massacre at Lawrence, Kansas, Bill Hicken switched sides and became a Union spy. During that time he probably met a beautiful young southern girl who later changed her name. By the early 1870s, Bill Hicken was a legendary gunfighter. Jed Baker didn’t expect to run into him in the Apache-haunted desert wasteland of the Southwest, near the scene of too many murders and attempted murders. If Hicken wasn’t the killer, who was? They said Lorn Chambers packed death in his black holsters. But Chambers was a relic from the past, the last of the great gunfighters. All the others were dead or had hung up their guns, trying to change with the times. Chambers turned his back on the future and rode off into the western wasteland, looking for what was left of the past. What he found was some vicious killers from his own past. They had robbed and murdered his parents years before and planned to kill Chambers before he could kill them. As young Jim buries his father, a burning revenge rages in him. 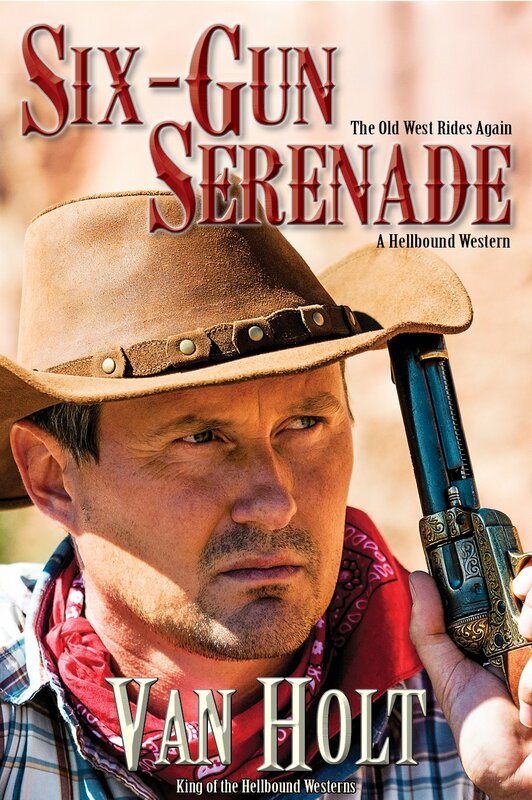 But what could a young teen in the old west really expect to do against hired gunhands? They called him a nester and after they killed his pa, he started calling himself Jim Nester. But what he needed was a six-gun solution. A tough, mysterious bounty hunter with a score of his own to settle helped him hunt the killers down. But Jim Nester knew that someday he would have to come back and fight the ruthless cattleman who had hired them—and the cattleman’s army of hired gunhands. The long trail means death in the Old West. But it’s a long and dangerous trail that Ben Russell must follow in his search for the men who murdered his father. Then it’s that other long trail for the killers when they go down before his blazing gun—the long trail to hell. 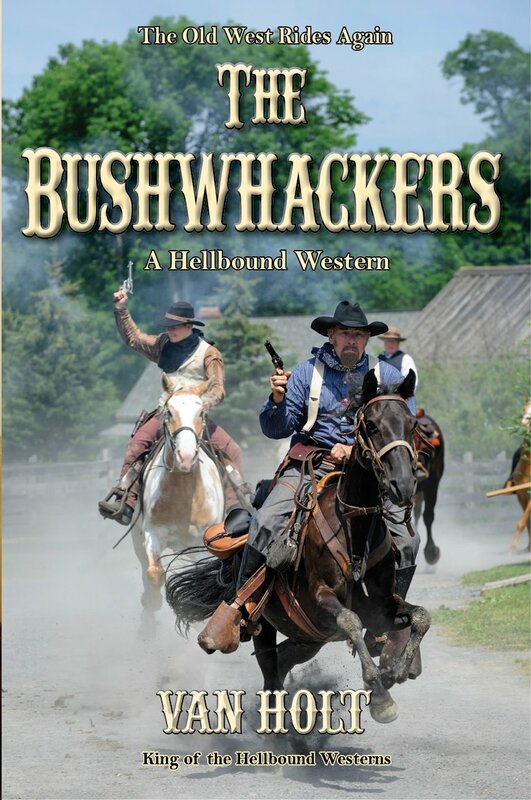 Van Holt’s hellbound gunslingers always send the bad guys where they belong. It just isn’t safe for them anywhere in the Old West anymore. Of course, the gunsters and punksters of our own time will feel a lot safer when the government disarms their victims and those who might be able to protect them if they weren’t afraid they would get in more trouble than the perpetrators.